Discover the parallels between your life and the Mysteries of the Rosary while experiencing the healing graces of Our Lady. Where our lives are characterized by trauma, stress, pain, or sadness, this ancient contemplative prayer can bring acceptance, understanding, and joy. Through a series of stories, reflections, and prayerful meditations, Father Longenecker reveals a powerful and very personal approach to using the Rosary as a process of transformation and healing from the inside out. Brought up as an Evangelical, Dwight Longenecker graduated from fundamentalist Bob Jones University. While there he became an Anglican and after graduation went to Oxford to train as an Anglican priest. After serving for ten years as an Anglican priest he converted to the Catholic faith with his wife and family. Eventually he returned to the United States to be ordained as a Catholic priest under the special provision from Rome for married former Anglican clergy. Fr Longenecker has written over fifteen books and booklets on Catholic spirituality, apologetics and prayer. He has authored hundreds of articles which have been published in newspapers, magazines, websites and journals in the USA and the UK. 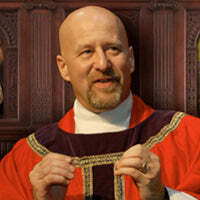 His popular blog published at the Catholic portal at Patheos is called Standing on My Head. He is a popular broadcaster, conference speaker and mission speaker. Married with four children, he now lives in Greenville, South Carolina where he serves as pastor of Our Lady of the Rosary Catholic Church.